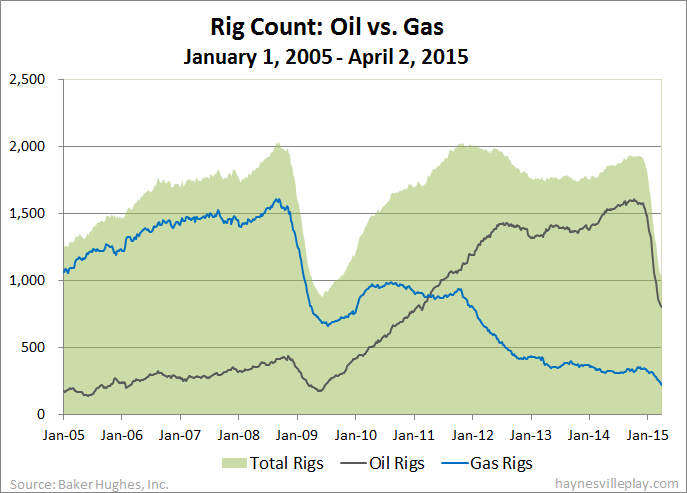 The Baker Hughes U.S. rig count was down 20 this week to 1,028. Oil rigs were down 11 to 802, gas rigs were down 11 to 222 and miscellaneous rigs were up two to four. Just like last week, the gas rig count is the lowest recorded by BHI since it started publishing its rig count in 1987. By type, horizontal rigs were down 13 to 799, vertical rigs were down eight to 136 and directional rigs were up one to 93. Among gas rigs, horizontal rigs were down eight to 179, directional rigs were down two to 34 and vertical rigs were down one to nine. Think about that: there are only nine vertical rigs targeting gas right now. Four years ago this week, there were 133. You have been busy today. Anyway you can update your map for current rig locations? Are you going to the NORA conference on April 20th in Shreveport? I'll update for last week's locations in a moment. I don't have the data for this week and probably won't be able to get to it for a couple of days.